(From Sony lens literature) The Sony 85mm F2.8 SAM (SAL85F28) is an ‘Easy Choice’ lens offering the 85mm focal length considered the standard for portraiture because of the natural perspective it provides. True to type it is extremely compact and light, weighing just 175g. This is the first full-frame lens in the ‘Easy Choice’ range, so its launch represents an important development of the line-up as a whole. The 85mm focal length is a standard for portraiture because of the natural perspective that it provides. 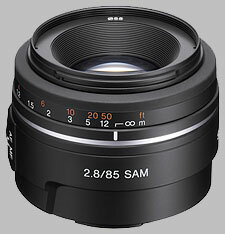 On an APS-C sensor camera the 85mm F2.8 SAM (SAL85F28) functions as a 127.5mm (35mm equivalent) telephoto lens – and features a Sonnar-type optical design that is considered ideal for mid-range telephoto lenses. The lens is sharp center to corner, and features smooth defocusing thanks to its large F2.8 maximum aperture and circular aperture design. At 0.6 metres, the minimum focusing distance is the shortest in its class, and SAM motor technology ensures smooth autofocus operation. The quality optical and mechanical features of the lens mean it is suitable for serious photography and should more than satisfy intermediate to advanced users. I'd rather have an 85mm f1.4 (Sony or Minolta), but I can't afford one - so the Sony 85mm f2.8 is the lens in my bag. It is a great little lens, sharp even wide open and incredibly sharp once closed down a stop or two. I was lucky to get one for a great price ex-demo and love it. It has become my go to lens for tack sharp images when I don't have one of my much heavier Minolta macro primes with me. Seriously sharp lens, awesome bokeh, close focusing for 85mm lens, cheap. Built like a toy, it will break if I sit on it on a couch. Hard to find, at least where I live. A metal mount would be nice. The lens is so underrated, Sony probably didn't sell enough of it, so they don't make a lot of it. I ended up purchasing a store display in Santa Barbara after months searching for this lens (has more than usual dust in it but they insist to sell it as a new lens. What a douche.) The lens itself performs great. I have not encounter any problem as some other do. An easily highly recommended from me. slow and noisy focus, not much better then a zoom lens, still recommend it because it's light and inexpensive. Don't border try it on NEX, a SEL5018 is much better. First you don't want to believe that this small lens could make this kind of images. Really great. Good color en contrast and great sharpness. It's worth the money double. Usable on a full frame and apc. VG-E CA, IQ. Very light. Physically small. Decent MFD. CDAF works well with LA-EA1 on NEX 5n. SAM is quieter than in-camera focus but noisier than SSM/HSM/USM. Plastic Mount gives a cheap feel to construction. The first review here really bombed a really nice lens. When you consider its modest price point, it is an exceptional lens. Most use a zoom at this focal length, but this one is sooooo easy to bring along that you can do a better job at 85mm, when the situation arises. For NEX 5n users, I recommend getting the 35mm f/1.8 first, then get this one. Use both with LA-EA1 for the full benefit of CDAF on photo and video. When used with EA2, it is a fine lens for both action shots and many kinds of video. Nice lightweight with great potential if refined a bit. The sample I have has a loose front element so it is going back. When you focus further and further away the focus follows OK - when you focus closer and closer it has a tendency to front focus. The color shift is red in front and green in back of the focus point. Otherwise the lens has a lot of potential - It performs very well at high apertures where the focus issue is moot. It is soft but pleasant wide open. As you know Sony is price-fixing their products -it will be a good value if they also fix the product.